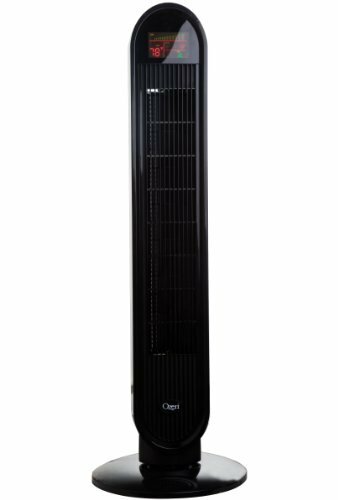 I have been using my Ozeri Oscillation Tower Fan and I love it. It is so quiet it is a pleasure. My husband does not hear as well as he used to and now I do not have to have the television so loud. This fan has so many features. It comes with a remote and you just insert the battery which is very easy. You can adjust the fan to 3 different speeds. Low, Medium and High. It has a timer that you can program to shut it off. It has a button for Mode which means you can leave it at a normal sound, also the second sound is natural, the third is for when you sleep. I find it very quiet on the Normal Mode. It has a dimming button if you do not want to see all the lights showing. This fan osculates 360 degrees. It can circle around the entire room. A super feature. It was very easy to install just three screws into the bottom and it attaches to the stand. This Ozeri Fan is very modern compared to a typical fan. I do not mind using the fan because of the sleep design. It actually does not even look like a fan. I am very satisfied and another great feature is it has an automatic Temperature to let you know the degrees in the room even when the fan is off. I received this Towel Fan Complimentary in exchange for my unbiased review and opinion. All opinions and words are my own.